The Sequoia Veterans Memorial is a 4,000 pound California gray granite monument, 6’ tall and 54” wide. It features the Sequoia Seal and 10” diameter polished black granite seals of the seven branches of the military: Army, Marine Corps, Navy, Air Force, National Guard, Coast Guard and Merchant Marines. The lettering on the seals is gold leaf. The monument is set on a patio of engraved bricks and is surrounded by 22,000 square feet of lawn. Redwood and weeping cherry trees grow near the monument and are marked with boulders with cast bronze plaques with a dedication from the donor. There is a lighted handicap accessible path leading to the monument and decorative concrete benches have been placed along the path. Each bench is engraved with a dedication from the donor. There is also a lighted directional sign at the street near the Brewster/Broadway entrance to the school. The Sequoia Veterans Memorial is located directly across from Carrington Hall and can be seen from Brewster Avenue and Broadway. We are still accepting donations in any amount and are selling engraved bricks for $100 each. We are also selling trees and benches. The trees are $1,000 each including the cast bronze plaque with a dedication of your choice. The benches are $3,000 and will be engraved with a dedication of your choice. Surplus funds from the sale of bricks, trees and benches are used for maintenance of the monument and future engraving. We also fund Cherokee Grants to teachers and students for classroom supplies, books, and field trips. 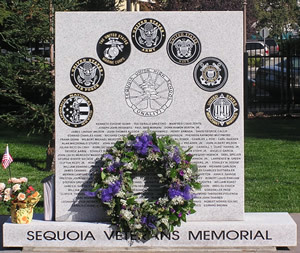 A dedication ceremony for the Sequoia Veterans Memorial was held on Saturday, September 17, 2005 with over 750 people in attendance. The ceremony featured a 35 piece military band, over 70 military personnel in full-dress uniforms, guest speakers, a wreath laying ceremony and a flag-folding ceremony. It was followed by a reception and light lunch in the Multi-Purpose Room.